In creating this series of sensory bin ideas, I wanted to come up with sensory bins that were quick and easy to put together, so all of these sensory bins contain two or fewer ingredients. I also wanted sensory bins that would be great for a baby, toddler, or a preschooler, so all of these sensory bins are appropriate (with supervision of course!) for all ages. I also wanted them to be simple and easy to put together, so all of these sensory bin ideas have items commonly found in a home - so no need to run to the store. I loved that each of the sensory bins were equally loved by my baby and my preschool daughter - sensory play is a great way to engage siblings in side by side play! My hope with this series was to remind everyone that play doesn't have to be complicated to be fun! And for those of you who are new to sensory play - I wanted to give you some nice and easy ideas for starting up. 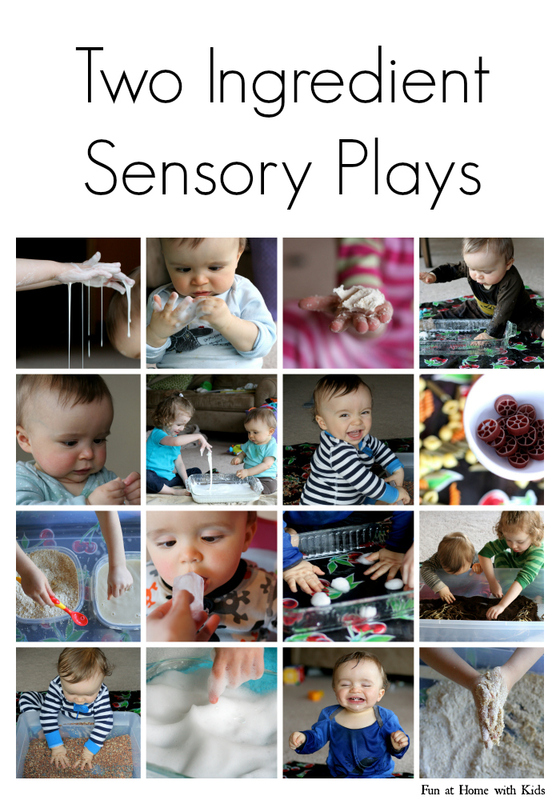 As I add more Super Easy Sensory Plays, I will add them to this post! What is that blanket/sheet you have under him in all the sensory play?? I would love to get one for myself! Last summer I got (and lost) your recipe for a playdough made with hair conditioner and something else. How do I find past posts if I don't know the name of something. I bought 3 bottles of conditioner to use with kids in my Saturday Fun Time here in Baja, Mexico. But i can't find the recipe. Please help! I don't mean to be a negative Nancy but I would be very careful using a lot of these with such little babies. All babies use their mouths for sensory too and most of these are serious choking hazards. They can breath the powdery and small grain ones into their lungs.